Staying true to the storyline, India secured a convincing victory by a huge margin of an innings and 272 runs to register their biggest victory in Test cricket. After wrapping up the Windies for 181 runs, India enforced the follow-on and then bundled the visitors out for 196 to take a 1-0 lead. Brief scores: India 649/9 dec (Virat Kohli 139, Prithvi Shaw 132; Devendra Bishoo 4/215, Sherman Lewis 2/93) beat Windies 181 ( Roston Chase 53, Keemo Paul 47; Ravichandran Ashwin 4/37, Mohammed Shami 2/22) & 196 (Kieran Powell 83, Roston Chase 20; Kuldeep Yadav 5/57, Ravindra Jadeja 3/35) by an innings and 272 runs. The audience for the India-Windies series suddenly became a substantial one for more reasons than one. Firstly, for those die-hard India fans, it was a welcome break from the rigours and losses of England series and for the other set of fans, it was a chance to see a child prodigy who had always destined for greatness making his debut for India. And no set of fans was going to be disappointed either as Shaw made the mockery of a Jason Holder-Kemar Roach-less Windies to complete his century on 99 balls and India, as expected, dominated the visitors to score 364/4 after 89 overs with skipper Virat Kohli and Rishabh Pant unbeaten on 72 and 17 respectively. However, the day clearly belonged to Shaw who shared a 206-run second-wicket stand with local boy Cheteshwar Pujara (86). Pujara reached his 19th Test fifty in the 23rd over and interestingly, it's the first time that he reached fifty before lunch on Day of a Test. After Pujara’s dismissal, Kohli joined Shaw and the duo made sure that India wouldn’t lose the momentum. Although Shaw was dismissed towards the end of the day, India ended the day on a comfortable note. While Virat Kohli never lost his calm in front of youngsters going gung-ho and scored yet another century, Rishabh Pant took the bowlers to cleaners to score his second 50+ scores in as many matches. A century was there for the taking, but his dismissal was the microsom of the way he was batting throughout - with sheer disdain for bowlers. However, the worrisome aspect of his batting was that he was trying to slog more rather than keeping the ball down the ground, which resulted in him being dismissed for 92. Jadeja then stole the show and scored his first international century in front of his home crowd. With India declaring at 649/9, Windies hoped for a good start, but they lost four wickets early on, with Mohammed Shami dismissing both the openers and Ravichandran Ashwin sending back Shai Hope. Jadeja then ran out Shimron Hetmyer before dismissed Sunil Ambris. Kuldeep Yadav also registered his name on the scoresheet as he dismissed Shane Dowrich as the visitors ended the day with 94/6, trailing India by 555 runs. After picking up the first six wickets in one session, India was sure that the game was pretty much done and it was all about time. Spinners then lived up to the lofty reputations and despite the wicket was still bowling friendly, they didn’t let their lower-order batsmen any time breathe. Roston Chase was the only batsman who didn’t allow the bowler to dominate him, but his stay was cut short by Ashwin after the former completed his half-century and the team eventually bundled out for 181 as India enforced follow-on. The second innings was expected to be a better show by the Windies batsmen, but it was just the repeat of the first barring Kieran Powell, who treated the bowlers with absolute disdain. 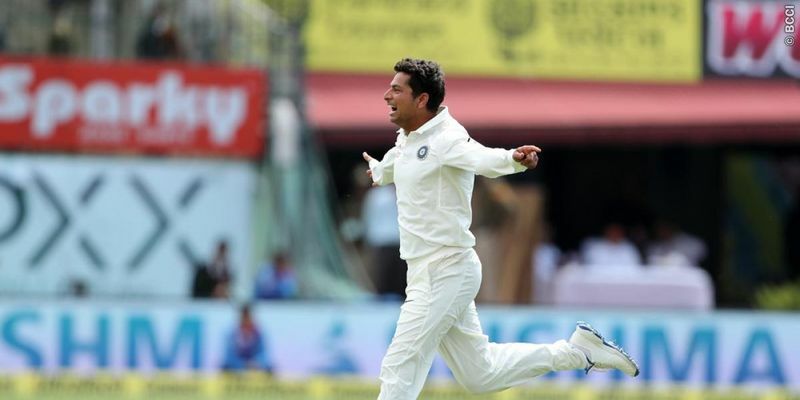 However, Kuldeep Yadav came onto bowl, he broke their back and secured his first five-wicket haul and handed India a victory by a margin of an innings and 272 runs.